The AmScope 40X-800X Polarizing Metallurgical Microscope is a feature-packed economical metallurgical microscope that has an upright design. It comes with a number of valuable features including a 16MP camera, top and bottom lights as well as twelve (12) magnification levels/setting. These make it an indispensable not only in metallurgy, but also for investigation of an array of objects and research. This Polarizing Metallurgical Microscope has an upright design, which basically means that the user views the sample from above. Unlike inverted metallurgical microscopes, the objectives of the upright microscope are above the stage and focus light down to the opaque sample. For this particular microscope, there is also a light source located beneath the stage, which can be used to view a transparent sample. Although it lacks some of the benefits of an inverted microscope, the top and bottom light sources also given the microscope an advantage. The AmScope Polarizing Metallurgical Microscope comes with trinocular, Siedentopf head. These are important features that present a number of advantages to the user. One of the biggest advantages of having a trinocular head on the microscope is convenience. Given that the microscope comes with a camera attachment tube, the user does not have to go through the trouble of removing the eyepiece in order to attach a camera when they want to take images or capture videos. In this case, users can easily and conveniently use the binocular eyepiece and capture images or take videos with the attached camera. In addition to the advantages that come with a trinocular head, the microscope also comes with a Siedentopf head. One of the main benefits of having a Siedentopf head is that it is easy to adjust. It also has a scale that can be used when adjusting the interpupillary distance to the desired length. Here, all the user has to do is set the interpupillary distance to the scale they used before. Another advantage of having a Siedentopf head is that one or more users can adjust the interpupillary distance without changing the focus. With a sliding head, changing the interpupillary distances affect focus and users have to compensate for the change manually. However, with a Siedentopf head, this is not the case, which enhances convenience for the user or many users. The microscope uses 10x and 16x eyepieces and plan-achromatic objectives. The eyepieces used for this particular microscope are high-eye point eyepieces that are designed in such a manner that the exit pupil is a distance away from the eye lens. Here, the distance between the exit pupil and eye lens is longer compared to other typical eyepieces, which makes it easier for those with eyeglasses to use the microscope. The design is therefore meant to accommodate different types of users. The microscope also comes with dual diopters, which allow for individual adjustment of the eyepieces. This is particularly beneficial for metallurgical microscope method given that users can adjust each eyepiece depending on their eye vision to view angles and depths of opaque objects. Plan optics presents a significant advantage in microscopy given that they help produce clear images across the surface of the lens. This is due to the fact that they come with stacked lenses, which offers high quality images when viewing the sample. In addition, these optics are designed to minimize the effects of chromatic and spherical aberration. Compared to simple lenses, the achromatic lenses offer a great advantage with regards to quality images. This is achieved because of correct color separation. Another advantage of the chromatic objectives is with regards to being cost-efficient when it comes to good polychromatic illumination and imaging having eliminated chronic aberration problems. The objectives also provide a long working distance, which allows for a wide space between the surface of the lens and the object. This is ideal in metallurgy as the microscope accommodates a wide variety of objects. The AmScope 40x-800x Polarizing Metallurgical Microscope comes with top and bottom lights. These offer the user twelve magnification settings. Together with the eyepieces, the metallurgical setting allows for six magnification settings (50X, 80X, 100X, 160X, 500X & 800X) while the bright-field setting also offers six magnification settings (40X, 64X, 100X, 160X, 400X & 640X). It is therefore a versatile tool that can be used for various applications including metallurgy and biological purposes. The AmScope Polarizing Metallurgical Microscope comes with both transmitted and incident illumination. The bottom light (30W transmitted illumination) is the type of illumination that originates from the bottom towards the objectives. Here, the light is typically used to view a transparent sample. For this microscope, the stage has an opening at the center that allows light to pass through and reach the sample before getting to the objectives and eyepieces. 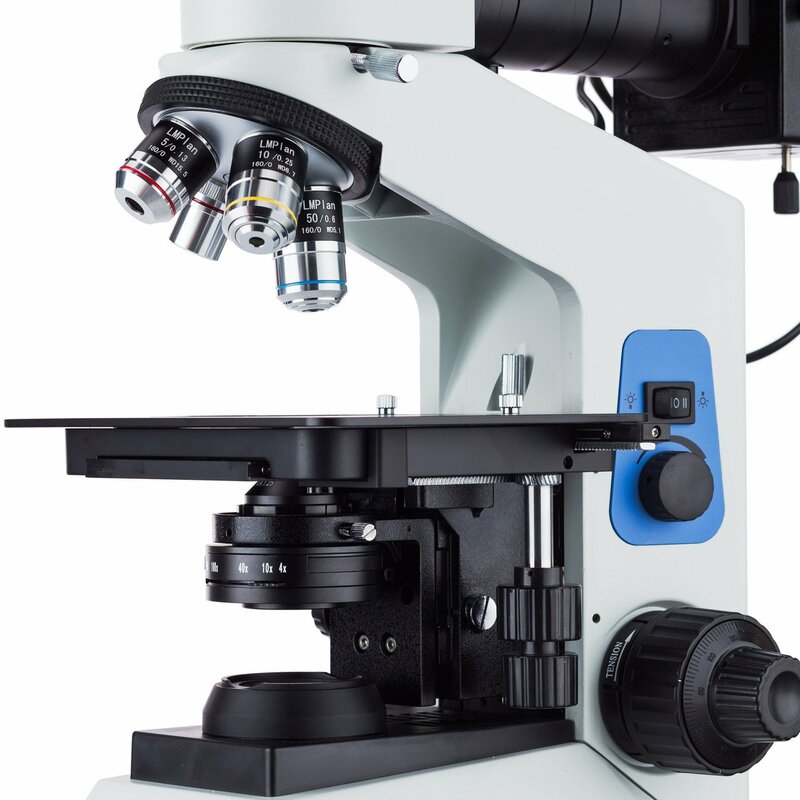 Therefore, the microscope can be used like other typical compound microscopes that are used to observe a variety of biological samples such as cheek cells, blood cells and different types of micro-organisms. In addition to transmitted illumination, the microscope also offers incident illumination (episcopic illuminator).This type of illumination directs light downwards to the sample from the objective. This system comes with a removable polarizer, analyzer and adjustable field and aperture diaphragms. These features allow the user to regulate the light to the desired level depending on the type of sample under investigation. The AmScope 40X-800X Polarizing Metallurgical Microscope comes with a high quality 16MP digital camera. This is in addition to a user-friendly software compatible with Windows, Mac and Linux making it a multi-platform imaging solution. Once installed, the camera system allows the user to capture high quality still images and live videos. The software also offers Extended Depth of Focus (EDF) for layering. Using the camera system and the software, users have the freedom to not only capture high quality images and videos, but also make measurements, edit and share images at high speeds. The AmScope 40x-800x Polarizing Metallurgical Microscope w Top and Bottom Lights + 16MP USB 3.0 Camera is versatile tool that can be used for various applications. This makes it a valuable tool that can be used in class, research and other industrial applications. Therefore, by getting one, users have the freedom to use it for a wide range of applications which is cost affective. It comes with a number of high quality features that offer sharp, clear images in addition to ensuring ease of function. This makes it a high quality device worth checking out.